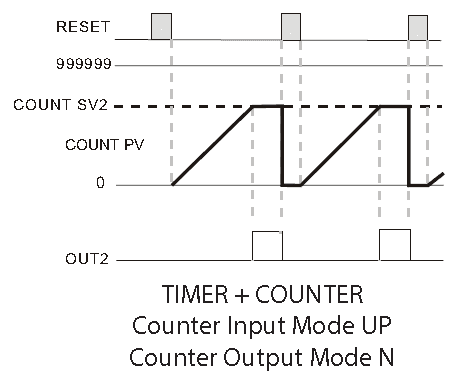 In Timer Counter Mixed Mode, timer period setting value SV1 controls Output 1 and counter setting value SV2 controls Output 2. Let’s get started. All timer and counter applications begin with a timing chart. The secret of using timers and counters is a good place to start for a review of how timing charts work. Once we find our operation mode, you look for the timing chart mode for your application. The manual includes all of the information that you need for that mode. 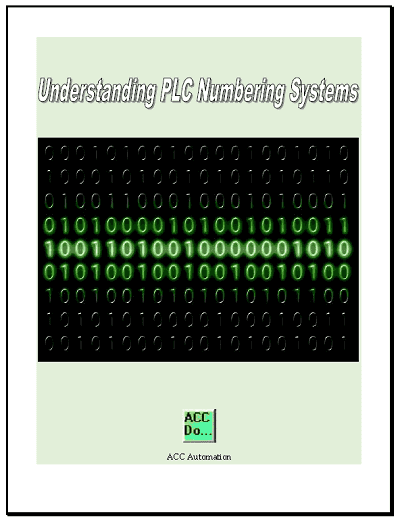 This includes wiring diagrams, timing charts, program steps and dip switch settings. 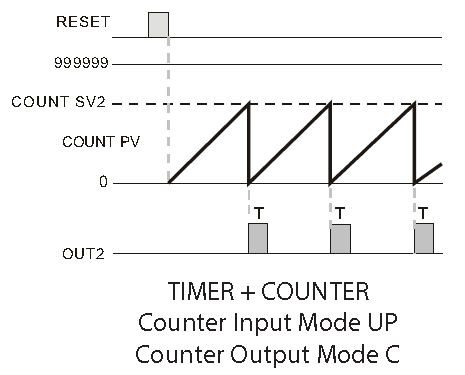 Example – CTT Signal on Delay 1 Counting Up timer counter mixed mode – Page 4-3 and 4-7 contain all of the information needed to program this mode. Each leading edge of the input signal at CP1 will increment the count present value PV by 1. 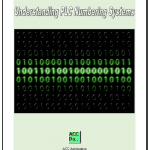 All of our sample programs will use the counting up input mode. 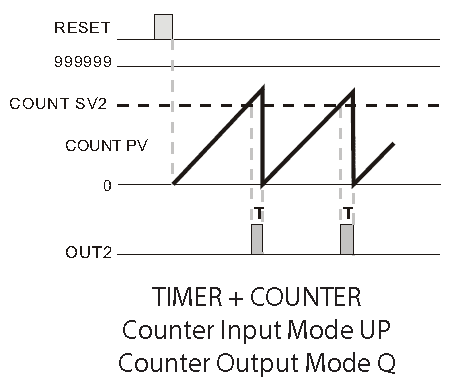 In Timer + Counter Mixed Mode, timer period setting value SV1 controls Output 1 and counter setting value SV2 controls Output 2. Output 1(Timer) will turn ON momentarily for the time set in the output pulse width parameter (tout1) or will be maintained ON (tout1 set to 0.00). 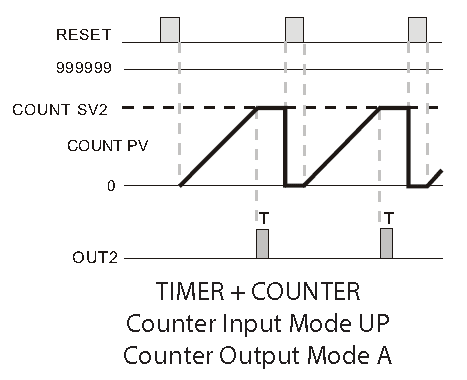 Output 2 (Counter) will turn ON momentarily for the time set in the output pulse width parameter (tout2) or will be maintained ON depending on the output mode selected. (t modE). At the end of the timing period Output 1 will turn ON momentarily for the time set in the output pulse width parameter (tout1) or will be maintained ON if the output pulse width parameter (tout1) is set to 0.00. 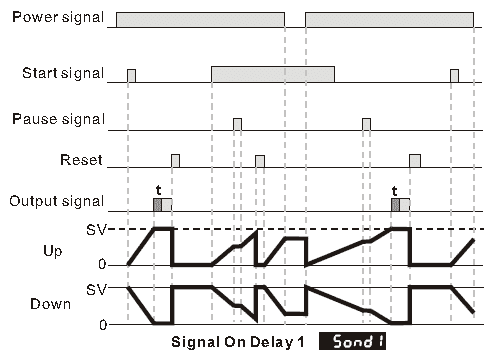 The trailing edge of the “start” signal has no effect on the outputs or timing period. When the count present value PV counts up to the count setting value SV2 Output 2 will turn ON. The count PV will remain at the count SV2 regardless of additional input signals. 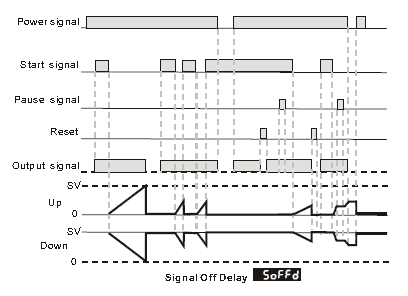 With power applied to the CTT, the leading edge of an input signal at START will begin the timing period setting value SV1 timing up or down based on parameter (t modE). At the end of the timing period Output 1 will turn ON momentarily for the time set in the output pulse width parameter (tout1) or will be maintained ON if the output pulse width parameter (tout1) is set to 0.00. 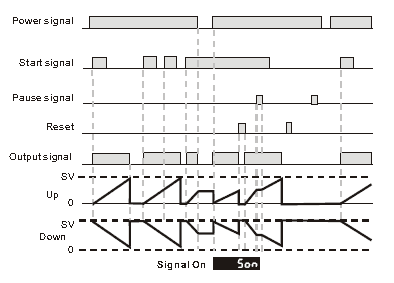 The trailing edge of the “start” signal will turn OFF Output 1 and reset the timing period. 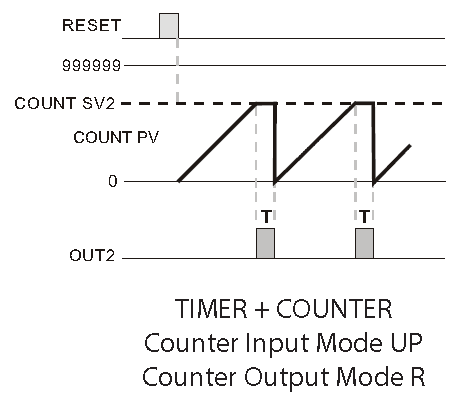 When the count present value PV counts up to the count setting value SV2 Output 2 will turn ON momentarily for the time set in the output pulse width parameter (tout2) and the count PV will reset automatically to 0. With power applied to the CTT, the leading edge of an input signal at START will immediately turn ON the Output 1. The trailing edge of the “start” signal will begin the timing period setting value SV1 timing up or down based on parameter (t modE). At the end of the timing period Output 1 will turn OFF. The leading edge of a “start” signal applied during a previously initiated timing period will reset the timing period. When the count present value PV counts up to the count setting value SV2 Output 2 will turn ON. The count PV will continue to increment with each input signal. With power applied to the CTT, the leading edge of an input signal at START will immediately turn ON Output 1 and begin the timing period setting value SV1 timing up or down based on parameter (t modE). 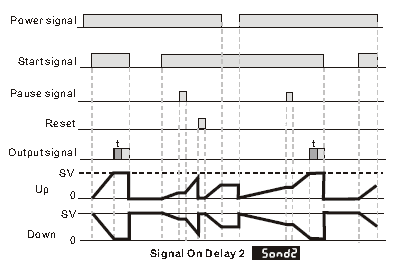 The trailing edge of the “start” signal has no effect on the output or timing period. At the end of the timing period Output 1 will turn OFF and the timing period will reset. The leading edge of a “start” signal applied during a previously initiated timing period will not reset the timing period. When the count present value PV counts up to the count setting value SV2 Output 2 will turn ON momentarily for the time set in the output pulse width parameter (tout2). 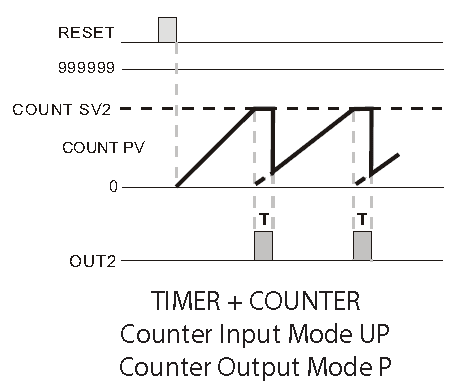 The count PV is prohibited from incrementing until the end of the output pulse time (tout2) when the Output 2 turns OFF and the count PV is reset automatically to 0. 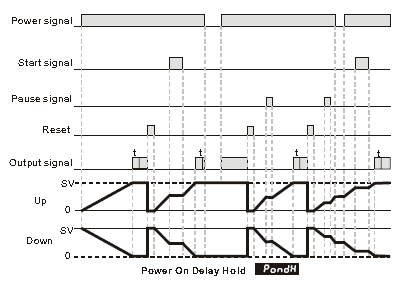 When power is applied to the CTT, the timing period setting value SV1 will begin timing up or down based on parameter (t modE). At the end of the timing period Output 1 will turn ON momentarily for the time set in the output pulse width parameter (tout1) or will be maintained ON if the output pulse width parameter (tout1) is set to 0.00. When the count present value PV counts up to the count setting value SV2 Output 2 will turn ON momentarily for the time set in the output pulse width parameter (tout2). The count PV will continue to increment with each input signal. When the count present value PV counts up to the count setting value SV2 both Output 2 will turn ON momentarily for the time set in the output pulse width parameter (tout2). 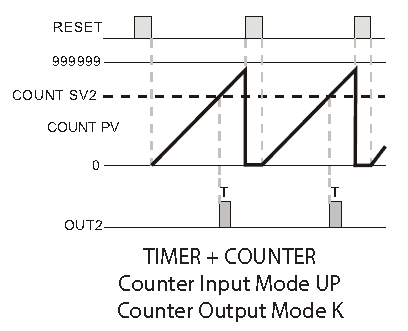 The count PV display is prohibited from incrementing until the end of the output pulse time when Output 2 turns OFF and the count PV is reset automatically to 0 and any input signals that occurred during the output pulse time. 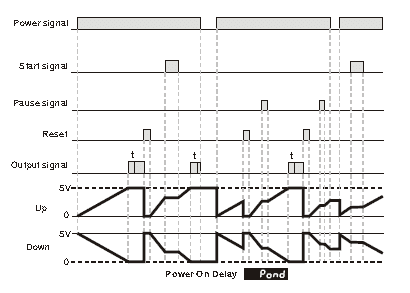 With power applied to the CTT, the leading edge of an input signal at START will begin the timing period setting value SV1 timing up or down based on parameter (t modE). At the end of the timing period, the timing period will reset and repeat automatically. If the output pulse width parameter (tout1) is set to 0.00 Output 1 will turn ON at the end of the first timing period, turn OFF at the end of the next timing period, turn ON at the end of the next timing period, etc. When the count present value PV counts up to the count setting value SV2 Output 2 will turn ON momentarily for the time set in the output pulse width parameter (tout2). 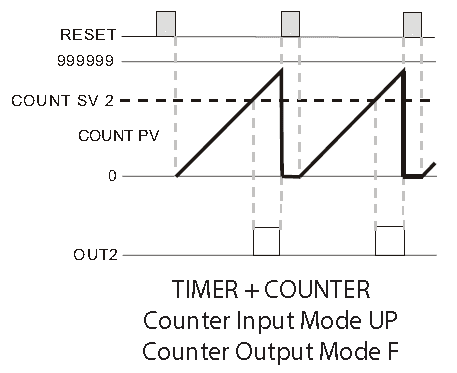 The count PV will continue to increment with each input signal until the end of the output pulse time when Output 2 turns OFF and the count PV is reset automatically to 0. If the output pulse width parameter (tout1) is set to 0.00, Output 1 will turn ON at the end of the first timing period, turn OFF at the end of the next timing period, turn ON at the end of the next timing period, etc. If the output pulse width parameter (tout1) is set to >0.00, Output 1 will turn ON momentarily for the time set in the output pulse width parameter (tout1) at the beginning of the each timing period. When the count present value PV counts up to the count setting value SV2 both Output 2 will turn ON momentarily for the time set in the output pulse width parameter (tout2). The count PV will remain at the count SV2 regardless of additional input signals. Next time we will look at the programming of the tachometer mode in the CTT.